It has been a pleasure to talk with so many people from around the world these past several years about the method and recipes they use to bake Springerle, folks from as far away as Switzerland, Germany, France and Canada. There have also been numerous folks from across the USA that have written in. I want to thank those that have sent samples of their cookies and have shared their recipes and stories with us all. It is interesting to see the variations of Springerle from different parts of this country as well as parts of Germany. All of the cookies that I have received were very tasty. It is interesting to note that no two bakers have sent the exact same cookie. The look and textures of the cookies have all been different, a sign of true home baking. Some had "feet" and some did not yet all were Springerle. Its kinda like grits, some folks use butter and water to make theirs while others use butter and cream to make theirs. Yet they're both still grits. I have been researching all aspects of Springerle for quite some time now. Springerle are such a rich and interesting culinary item with over 400+ years of existence and one that seems to bind families together. Recipes and molds passed from generation to generation and some still in yearly use to this day. One of the most unusual and amusing recipes was one from several hundred years ago. In describing the directions for making Springerle, the baker says to have the eldest son mix the dough until he is tired then have the second eldest mix the dough until he is tired, then have the next son in line mix the dough until he is tired. With that having been said, I believe that Springerle dough at one time was mixed for quite a while. Following are a couple recipe variations - I hope you have fun and enjoy them! If you are making Springerle for the first time, please read over the recipe you will be using once or twice first. This way you will know sorta what to expect and not leave anything out. As other recipes are sent in I will try to post them as soon as possible. If you have a recipe that is different and you think others would like to see it, send it on in. Dissolve hartshorn in water and set aside. Beat eggs till thick and lemon-colored (10-20 minutes). Slowly beat in the powdered sugar, then the softened butter. Add the hartshorn and water, salt, preferred flavoring, and grated rind of lemon, lime or orange, if using. Let this mixture mix on medium speed for about 30 minutes or so. At times if I'm busy I let it beat for 40 minutes or more. Gradually beat in as much flour as you can with the mixer. Turn onto floured surface and knead in enough of the remaining flour to make a good print without sticking. After trimming your Springerle allow them to dry for between 16-24 hours before baking. This will allow the image to crust and thus prevent it from being distorted. Large Springerle can take from 24 - 48 hours to dry. Here in the South in the Summer my large Springerle at times seem not to want to dry so I have a fan blow on them and it really helps. Bake on baker's parchment-lined cookie sheets at 225° to 300° till barely golden on the bottom, 15-30 minutes or more, depending on size of cookie. Store in airtight containers. They keep for months, and improve with age but become hard as rocks. Yield 3 to 12 dozen. PLEASE NOTE: Some days the dough requires all the flour and others it does not. It varies with the conditions of the day. Try using various flavors such as anise, almond, lemon, orange, lime, vanilla, vanilla orange, chocolate, chocolate orange, espresso, spice, amaretto or any combination. Any combination or single flavor that you like is the right one. Traditionally anise was the flavor used and it is great with Earl Grey tea. *Hartshorn or Baker's Ammonia (a.k.a. 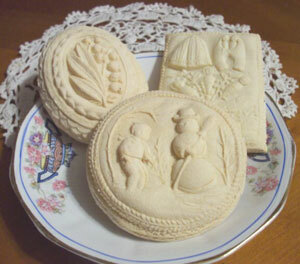 Ammonium Carbonate) An old-time leavening unexcelled for any cookies, producing an especially light, delicate texture. Hartshorn and baking powder can be used interchangeably in cookie recipes. Dough made with Hartshorn stores well and its leavening action is only triggered by heat, not moisture. Not affected by age, but will evaporate! There will be an ammonia smell during baking, but not in your cookies. Beat whole eggs till they thicken. Add sugar gradually, beating well between each addition until all is combined and then beat well for about 15 minutes. This makes the finished cookie fine grained and light. Add the anise oil and blend. Fold in the flour lightly. Roll out the dough about 1/2 inch thick. Flour the springerle molds carefully and press firmly onto the dough. Remove the mold and cut the cookies along the line of the imprint. Flour the mold each time it is used. Sprinkle anise seed, if desired, on greased cookie sheets before placing the cookies on them. After baking, let cookies stand overnight in a cool place to dry. In the morning, place first in a 375° oven to set the shape, but reduce heat immediately to 300°. In 15 minutes the cookies should be light in color with the appearance of having been iced. This recipe makes an average of 72 cookies. Keep cookies in a tight can for two or three weeks before using to have the best flavor. To soften them, put a cut apple in the can a day or two before using. The apple will also add a delightful aroma to the cookies. I have purchased from you in the past. Thought I would pass along a pic of my springerle, hope you enjoy it.